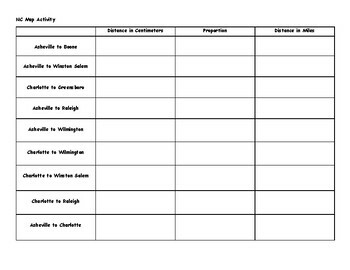 This North Carolina Map Project allows students to use proportional reasoning skills to calculate the actual distances between cities in North Carolina and also the cost of gas to travel between cities. 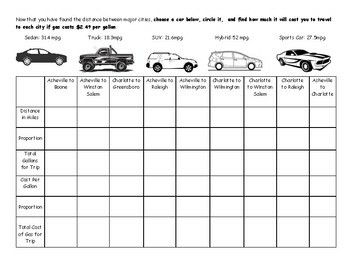 Students will find actual distances by using a map scale, then students choose a vehicle from a list given, and find their gas cost depending on the mpg of that particular car. This project encourages students to use multiple steps to reach the final answer and use proportions and unit rates for each step of the process. The real world connection also keeps students invested and helps them see the application of proportional reasoning.